The Double Dipped Life: The ABC Challenge! Good Morning! As you can see from the state of my blog, I haven't been in the kitchen much lately. With sickness and the holiday rush, there just hasn't been time. So... I need a challenge! Let's cook with the letter D this week! Just a warning; we're getting into the more challenging letters. So, I need your creativity to help me out! 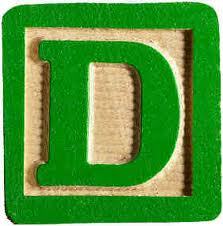 What can you make with D? Remember, we need specific D's, not just categories like Desserts, or Dips! Be creative! Duck? Dill? Donuts? Remember, it doesn't have to be a main meal! Please comment if you are accepting the challenge, and then enter your post or recipe into Mr. Linky! Rules are on our first ABC Challenge Post! Lani, it would work! I'm surprised that I didn't think of that!